NASA’s Mars rover Curiosity has uncovered carbon molecules, key materials for life to exist on the planet. The discovery was detailed in a new study published by Science on 8 June 2018. The existence of carbon molecules does not amount to proof there is, or has ever been, life on Mars but it adds significantly to our knowledge of the planet. The study notes the in situ detection of organic matter in a 3.5 billion year old formation at Pahrump Hills, Gale Crater. The rover used evolved gas analysis to detect the matter. “These results do not give us any evidence of life,” Jennifer Eigenbrode, a Scientist at the Solar System Exploration Division at NASA’s Goddard Space Flight Center and lead author of the article told Space.com. “But there is a possibility that (the organic matter) are from an ancient life source. Eigenbrode said the discovery was an important and exciting breakthrough. “When you work with something as crazy as a rover on Mars, with the most complex instrument ever sent to space, it seems like we’re doing what may have been perceived earlier as impossible. A second new study revealed that Martian methane levels ebb and flow. The chemical compound only lasts hundreds of years so there must be some source of it on Mars. The implications of this new knowledge are not yet clear. 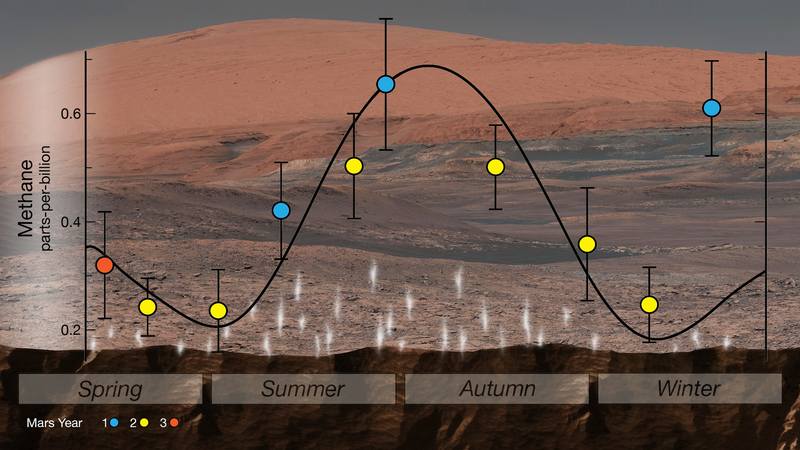 “We don’t have seasonal variations in many molecules in Earth’s atmosphere, so to have a planet have seasonal variations in chemistry is very otherworldly,” Eigenbrode said. Chris Webster, a Senior Research Scientist at NASA’s Jet Propulsion Laboratory in California and lead author of the second paper, said in a press release: “This is the first time we’ve seen something repeatable in the methane story, so it offers us a handle in understanding it. Curiosity is a six-wheeled vehicle that landed on Mars in August 2012. It has been conducting drilling and using technology known as Sample Analysis at Mars (SAM) to search for signs the planet could support microbial life. It previously found data which shows the gigantic Gale Crater was once home to a lake which could have possibly supported life. Thomas Zurbuchen from the Science Mission Directorate at NASA Headquarters said the discoveries gave the agency motivation to keep exploring.